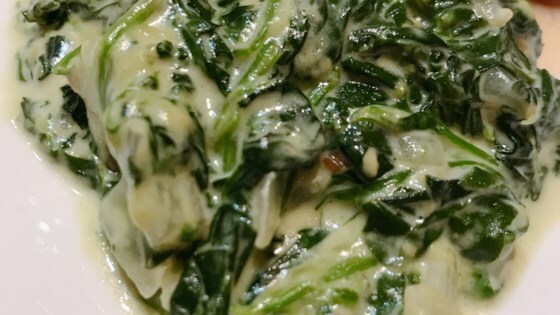 "Spinach creamed with evaporated milk and simmered with onion and garlic." The garlic and onion flavors just didn't mesh well with the taste of spinach. this recipe is easy to understand and the spinach was tasty!! This recipe is good. I am trying to match it to a side dish I had at a resteraunt in San Francisco and this is the closest yet! A little watery, but a good way to eat spinach. I can't say I really enjoyed the taste of the spinach as a stand-alone, but when eaten with something else it tasted pretty good.